Fear Of The Thing | The Fantastic Flame On! It’s been quite a while since we’ve seen Ben, his appearance and his actions causing panic amongst his team-mates or the population of New York. Here, a combination of short-temper, bad timing, and Beethoven, means that Ben’s irascibility inadvertently causes drastic consequences. Exiting a symphony performance, an uppity yet surprised man accidentally knocks Ben’s hat off when he points out the troops marching down the street. 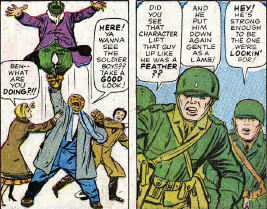 Ben retaliates, but, unaware that the troops are looking out for an enlarged, super-strong being, quickly becomes the focus of attention. It’s a nice escalation of the normal bad-behaviour for Ben – the army has only got involved twice before, once when ordered to and once when a hate ray incited them to. Here, reacting to what would at the time have been a pretty unusual and borderline horrific event. I really like today’s instance of Fear Of The Thing. It’s an fictional Fear, coming as it does from Ben’s imagination as he tries to come up with a reason for getting out of the celebratory dinner hosted by the US government. 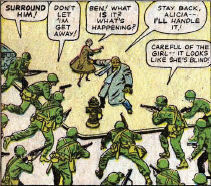 The thing that causes this little unreal rampage is some unexpected photographers, showing not only a wonderful sense of self-awareness from Ben (little more than a drop of a hat would cause his outbursts in these early issues) but also highlighting a theme more associated with Hulk – fear of the monster within. 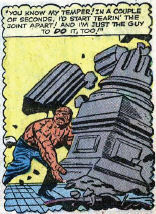 I’m beginning to wonder if I should have named this blog after Ben Grimm, as we’ve had far more posts devoted to his activities than we have the Human Torch’s. A discussion as to what to do about Johnny’s departure from the team turns ugly as Ben makes no bones about what he’s going to do when he catches up with him. Sue’s reaction clearly shows how terrified she is of Ben at this time. 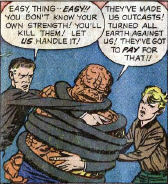 We’re back to what is clearly the most predominant recurring feature of the early issues, Ben Grimm’s anger issues. Here, he is called on stage by the Miracle Man and humiliated (through hypnotism) when the Miracle Man slices a massive log in two with his finger (through hypnotism). He then takes a full-force Thing punch to the chin without even blinking (through hypnotism). This is the final straw, and Ben loses his rag and has to be restrained from pounding the Miracle Man into the ground, which he probably wouldn’t be able to do (through hypnotism). What’s that you say? You’ve never heard of the Miracle Man? Not surprising, as he didn’t make another appearance for 11 years, then made only a couple more appearances before The Scourge of the Underworld shot him to death (with hypnotism a bullet). It’s a multi-panel spectacular today as Ben has one of his most spectacular meltdowns to date. 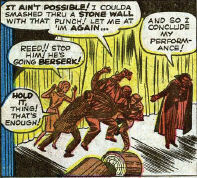 Here, the team assault the Skrulls’ hideout to rescue Johnny, and Ben sees Red. 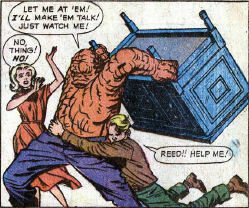 Not helped by Reed’s insistence on calling his long-time friend “Thing”, he threatens to smash a heavy dresser over the heads of the Skrulls. What makes this really stand out is the way Reed takes this into his stride and threatens to turn The Thing loose on the Skrulls unless they tell him everything. This dangerous and manipulative side to Reed is seldom seen. As we get to see the entire team in these three panels, I just wanted to drop a quick note about the costumes. When The Fantastic Four was conceived, Stan wanted to move away from the conventions of the genre, including having the team in costumes. These first two issues feature the team in civilian clothes throughout, and seeing Reed in a suit and Ben in a pair of slacks does look a little strange. This unusual appearance coupled with the darker behaviours seen in these early issues gives us a Fantastic Four that is both familiar and different, resulting in a less-familiar reading experience across these first few issues. Just a quick postscript to yesterday’s post, with this great reaction from the rest of the team. It’s not often we have three of the team members conspiring against the fourth, but we absolutely get it here. The two-tone colouring and sotto voce whispering add to an air of conspiracy which, thankfully, wouldn’t become a staple of the series.